This is how I started praying for safe travels. In 2005-2006, I worked in Afghanistan. To go to work everyday, I had to drive (actually I was passenger in a carpool van) on Jalalabad Road. This road is part of a highway that connects the Afghan capital of Kabul to the city of Jalalabad in eastern Afghanistan. This road is considered one of the most dangerous in the world due to traffic accidents. To keep myself from worrying about accidents and bombings, I used to try and keep busy during the car trip. As this was 2005, before smartphones, keeping busy meant thinking, talking, reading, or sleeping. In the car, I used to say a quick personal prayer for protection (silently to myself) and then think about yoga. I was deep into learning the ashtanga yoga first series poses so I used to close my eyes and visualize these poses and their names in my mind. This private personal prayer followed by yoga visualizations was how I started “praying” while traveling. Yes, I know that I was not saying the “Jewish Traveler’s Prayer” and maybe I was not “praying” at all according to another person standards. When I look back, I see that I was trying to settle myself and withdraw into a protective internal space. At that time in my life I was unaware that there was a Jewish traveler’s prayer. Fast forward to 2009. I was pregnant and in NY City. My husband and I had just finished a two year stint in Democratic Republic of Congo (DRC) and had been attending weekly Shabbat dinners at the Chabad house in DRC. So we decided to take a tour of the Chabad Headquarters. During the tour we visited a Jewish book shop that sold business card sized laminated prayer cards. One one side it had a photo of the Rebbe and on the other it had the Jewish traveler’s prayer. I remembered my Afghanistan car prayers and bought one and kept it in my wallet for years. Sometimes I would remember to take it out and read the prayer when I was sitting in a car or on a runway before taking off on a plane. Either way, I always kept it on me and became attached to it. I lost the traveler’s prayer card last year and I felt sad. I missed having the physical prayer card with me to help remind me. I made these printable traveler’s prayer cards for us in English and Hebrew. These Traveler’s Prayer Cards are available for immediate download and come in a high quality (300 dpi) PDF file for ease of printing. When you download the file you will receive one PDF that contains eight business card sized Traveler’s Prayer Cards that you can share with family and friends. 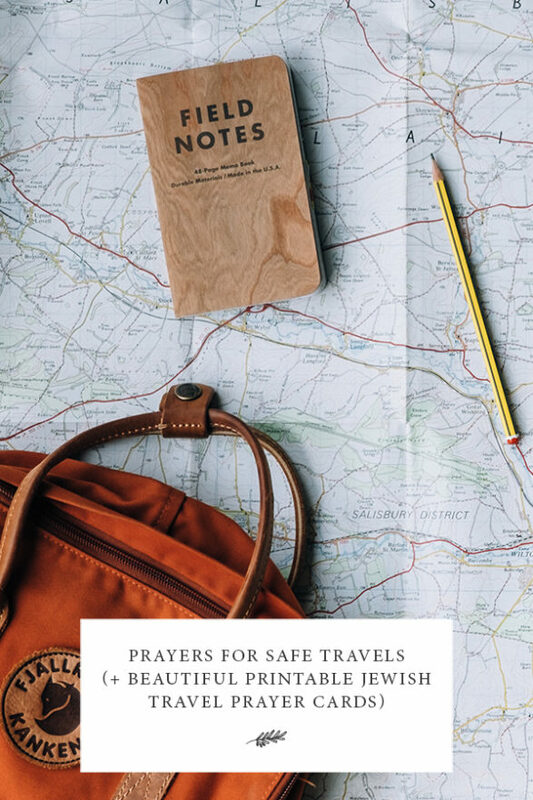 These Traveler’s Prayer Cards are simple to make. You can print the English version or the Hebrew version or both when you choose “double-sided printing”. *Please note that this product contains the name of G-d. If you print it out, please treat it with appropriate respect. Next What’s In Your Pantry, Emily Jay Berg?